This year I thought we’d try the Christmas letter idea a bit differently. Last years letter got copied, but never mailed – so if you happen to be the one and only person that actually follows along with us from year to year and you feel the gap, let me know and I can get you a copy one way or another. So this year we put at a grave disadvantage the folks we know that have no internet. And I put YOU at a grave disadvantage because there is unlimited space HERE for me to rattle on for pages. So with that disclaimer if you dare travel further… here’s our year in a “quick” review, photos included! 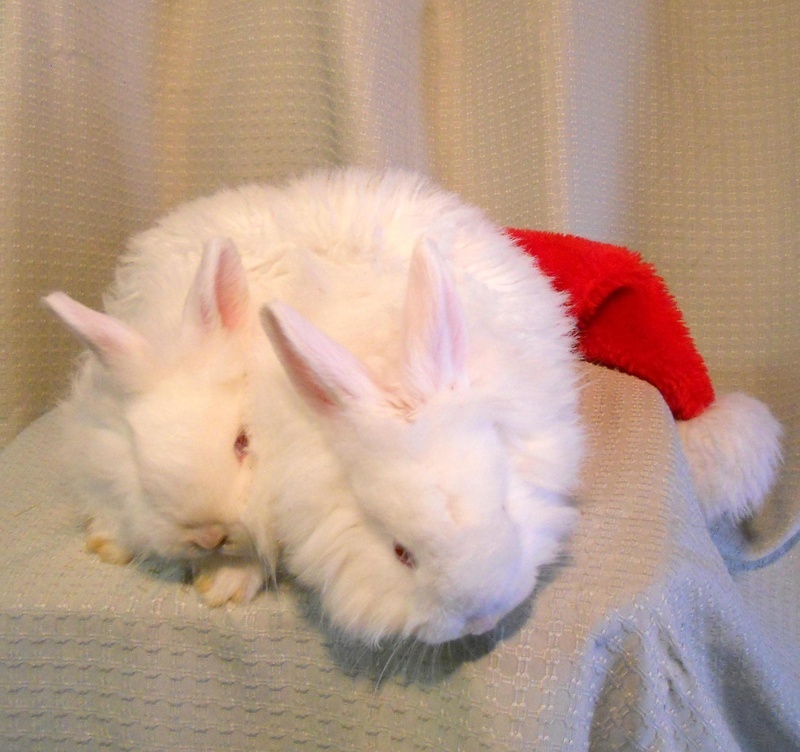 We begin at the end and end at the beginning… by sharing a quick holiday photo of some of the fluffy buns. And with that said I’ll point out to those that didn’t know – we’re into the rabbits big time now. We have multiple breeds, too many breeds, specializing in more of the rare and heritage varieties. American Chinchilla, Champagne d’Argent, Silver Fox, New Zealands…. Then toss in the woolies, the German Angoras, the Satin Angoras and the hybrids of the two. We have some bunnies! During the three seasons that don’t include snow we have upwards of a few hundred at one time. With a WSDA Processor’s license we process the ones that aren’t sold (or kept) and can legally resell the fryers. Hint – we have lots of frozen fryers. It has led to some interesting side lines, being the local crazy bunny lady. Chuck continues to be the great enabler, and though he may not “enjoy” rabbit shows, he seems to tolerate them well enough. 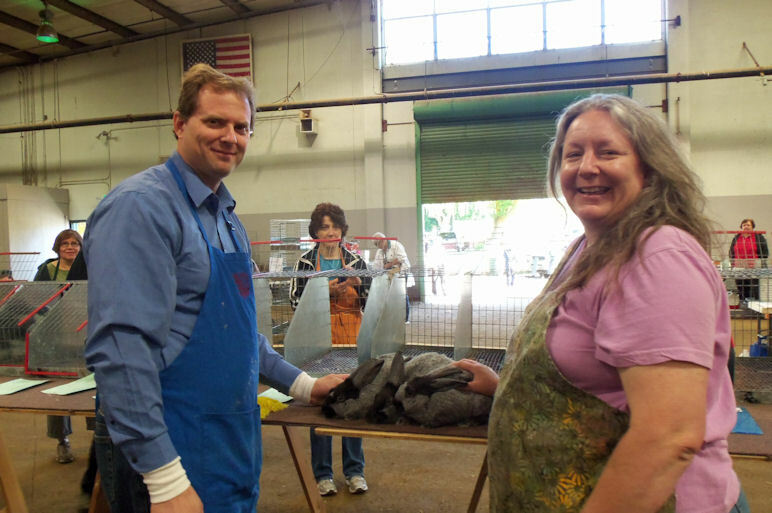 Meatpens are a particular class competition at ARBA (American Rabbit Breeders Association) shows. A group of three young fryers under 70 days old, between 3 and 5 pounds are shown as a group. At the Washington State Rabbit Convention our Champagne pen won for Show B, beating out many fine New Zealand pens (who are the most common winners). It was a highpoint of the show year for me, and other breeders of the rare and heritage breeds! This spring a stranger walked among us for a short time. Chuck groomed off all of his extra hair, for the first time in 20 +/- years. I didn’t recognize him! He quickly grew tired of me staring at him all the time and grew back the whiskers (Christmas was coming – don’t you know). 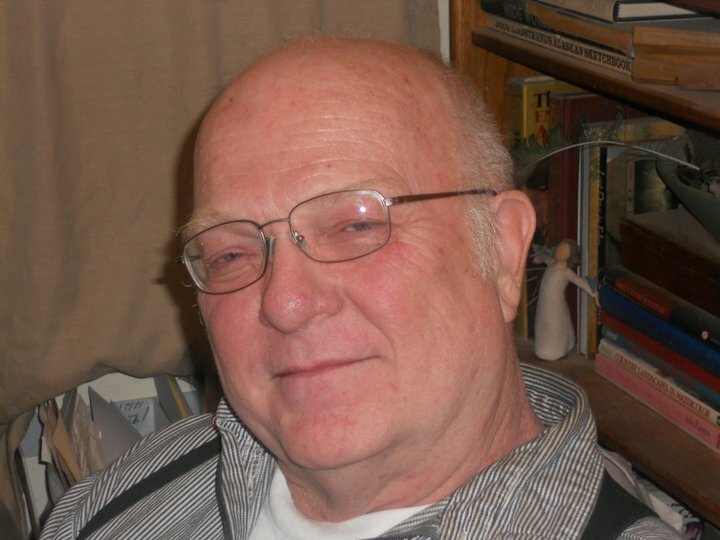 Chuck started off 2011 by cutting back on his hours for a few months, and going fully retired on March 1st! For a man that has worked hard his whole life, I thought there might be problems… but didn’t realize how hard he’d start working here at home. 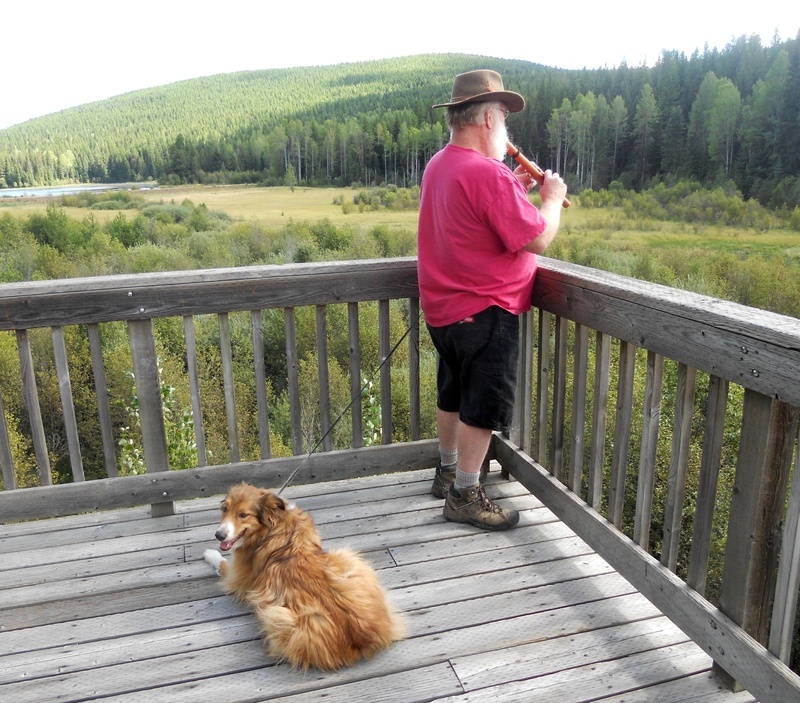 Several years ago we got the property surveyed, and Chuck finished up getting the whole hillside fenced. A daunting task that required him to pack metal posts up the hill (pretty darn steep!) repeatedly… the four leggeds enjoyed the free run of the acerage afterwards, though only a select group of llamas were brave enough to go clear to the top of the hill. After that project his next was to build what we call “The Station”. It is the grow out area where young fryers go to wait for the bus to Freezer Camp (yes, we avoid reality at all costs). Spring found us expanding in a few other areas (besides our waistlines). Cinnamon our milk goat gave birth to quads. Freckles, another dairy goat had a single and began her career of milking as well. We’ve cut back some since then, but the goats are providing us with some lovely milk for cheese, the young wethers are in the freezer now for cabrito. 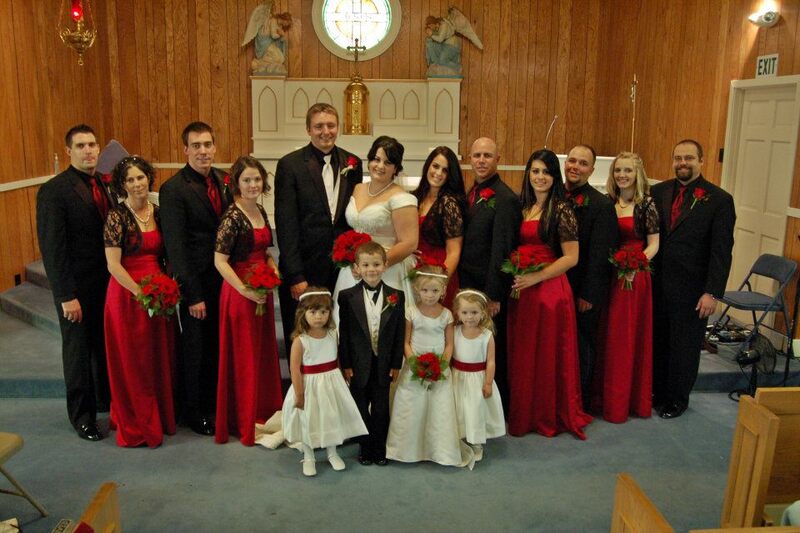 And Chuck is the new milkmaid, or what that be milkmate? We had some youngsters of the camelid variety this year as well. 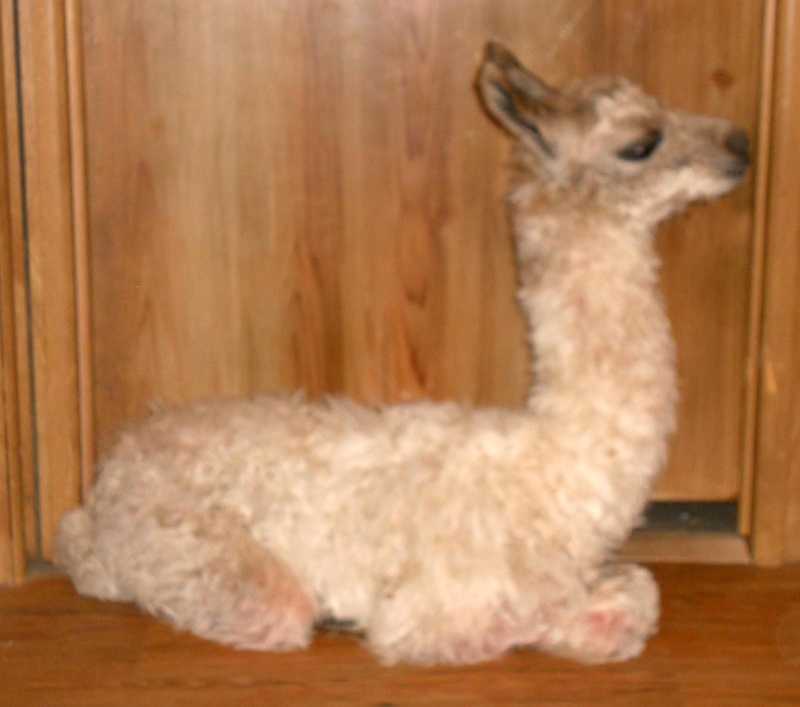 Poppy and Kyrie gave us our first Cria – Maude. Dusty gave birth to a young son, but then prolapsed and died before we found her… we named her little one Miracle. He spent the first few weeks in the house being raised on goats milk (bless those goats!). Eventually over time he moved down to live with the rest of the woolies. Chuck is his Daddy/Mommy/ray of sunshine in his life and continues to feed him a bottle each night. We were quite nervous after Dusty’s death to have the remaining llama mama give birth unattended, but thankfully Ellie decided mid day to labor, and with assistance delivered her daughter Mattie. Mattie is one long lean lady. 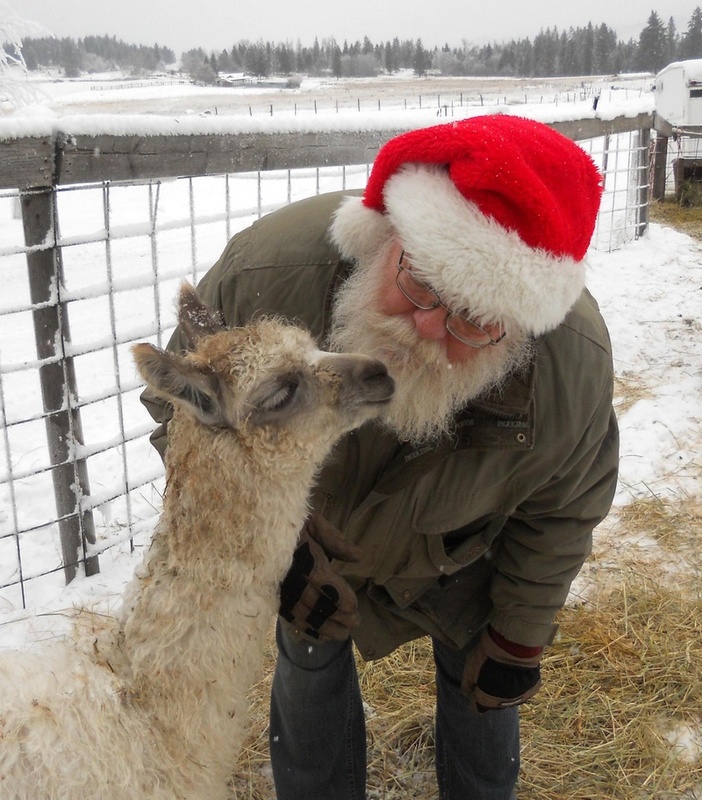 While we are guessing that Maude and Mattie share a sire in Kyrie (the llama), we suspect that Miracle’s biological Dad is Kris Krinkle (the alpaca). Either way we have an abundance of cuteness and wonderful fiber to come. Our summer was filled with highs and lows. My paternal Grandmother, Helen Dalke passed away in June. I was unable to attend the funeral because of Chuck going in for some scheduled testing. He had been diagnosed with Bladder Cancer in September of 2010, and had multiple proceedures to remove the growths that kept reoccuring (TMI?). This summer he went through a six week treatment program, which I won’t make you cringe over, that has proved to have been VERY beneficial. His last “scoping” showed no new growths, and no cancer! He will start the New year with another scoping, and our fingers and toes are crossed that it will be more of the same. 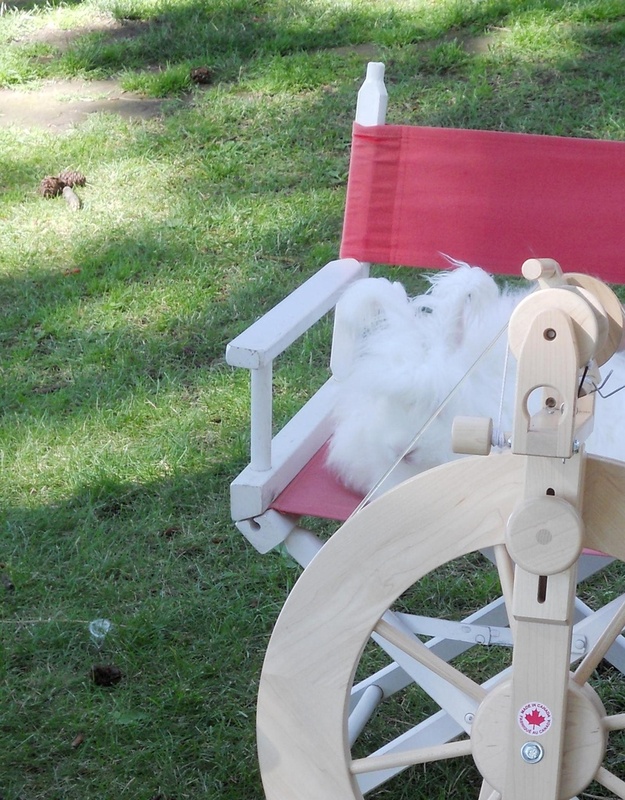 Spin in the Park, an annual local event put on by our area spinning guild, was enhanced with the addition of an angora rabbit show. Lots of fun! It allowed Berry to come out and commune with the spinners. He may not be the sharpest knife in the drawer, but he is one handsome dude! 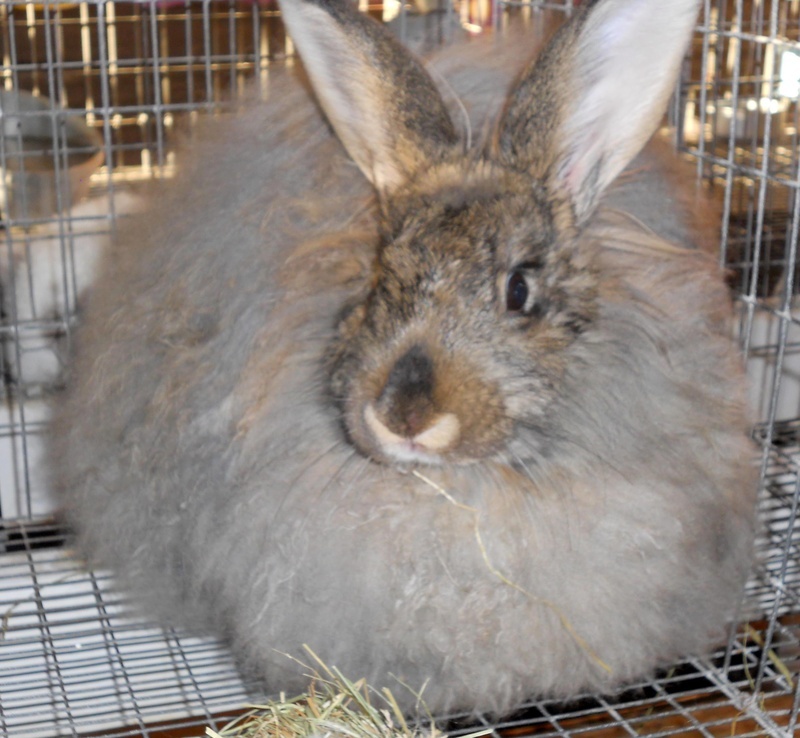 Miranda, one of our home grown beauties, went on to win Best In Show at the Northeast WA Fair, and also the Angora Specialty held at an ARBA show in October. She’s gotten enough legs/points for her Grand Championship now and will retire to maternal duties. More beautiful does, Stella, a Champagne d’Argent and Mora, a Satin Angora also finished up their GC’s. We have several more rabbits that gathered legs towards their own championships. Daisy Hill Rabbits rock (do I sound young when I say it that way?). Can’t be too young, Lily, our Granddaughter entered Kindergarten this fall – and I’m still unclear how that happened! In August we were surprised, in a not-good-way, when I was diagnosed with Stage 3 Breast Cancer. 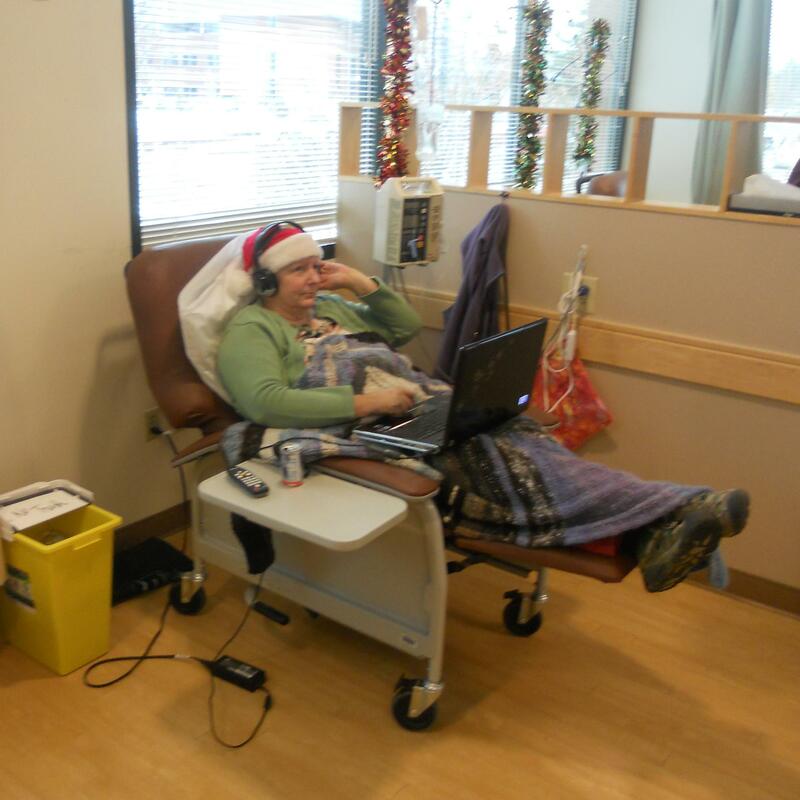 Much of our fall has been spent at testing appointments, and undergoing Chemo treatments. Two more Chemo visits to go, then surgery followed by radiation. I suspect in many ways it has been harder on Chuck than it has on me. He has had to watch as the hair has come out (still holding onto a handful of eyelashes at this point), the side effects have caused me to be unwell. He’s done a wonderful job taking up the slack where the animals are concerned on the days when I can’t make it down to the barn, and all the public contact that I can’t do (i.e. Grocery Shopping, Feedstore) because my immune system can’t be in contact with germs from the general public. 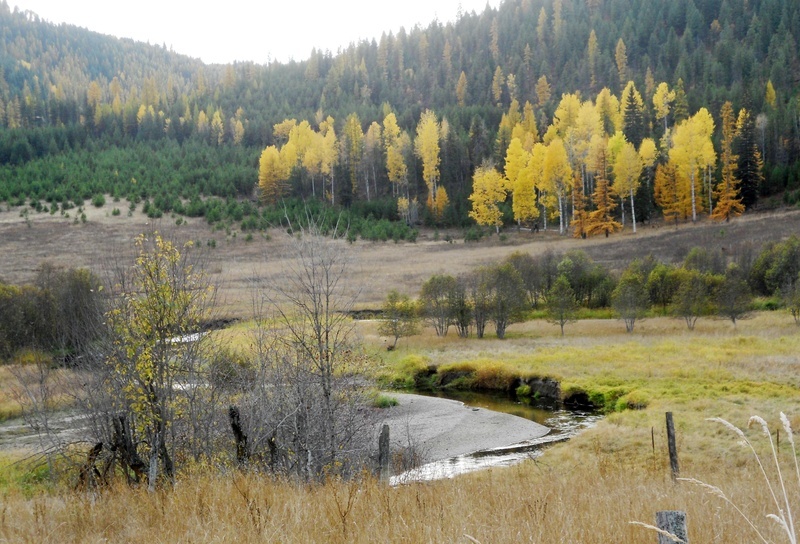 When it gets tough, we’ve been known to take a drive into nature. It helps us both recenter, and recharge so we can go on. Thankfully we live right in the middle of an area that is so breathtakingly beautiful. 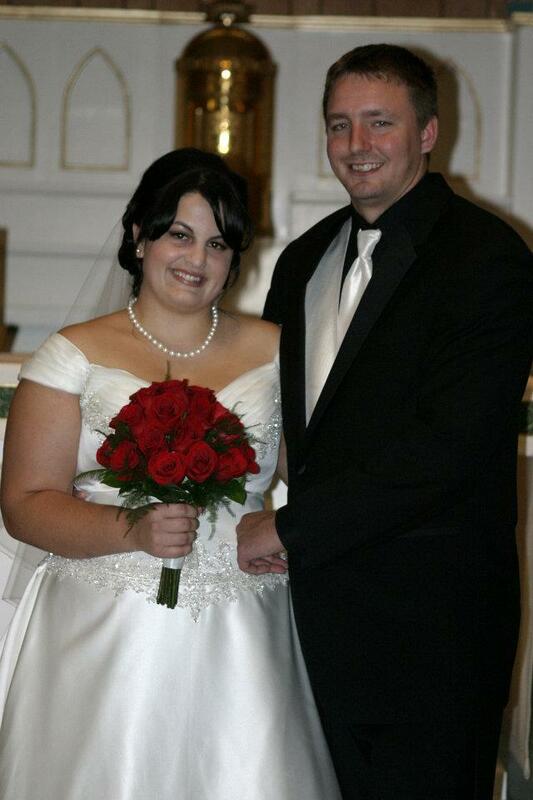 Tyler married a wonderful young woman named Jessica Campoy. It was a joy to meet her family and feel included in their happiness. They appreciate Tyler, and have embraced him as a part of their own – which makes me very happy. 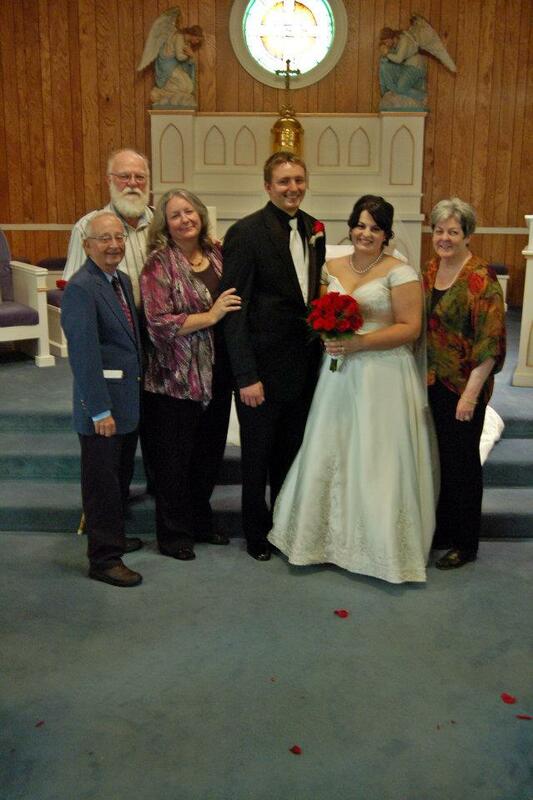 Both my Mom and Dad were able to make it to the wedding, and I enjoyed getting to spend time with both of them. Not to mention getting to see parts of my family that live around the Sacramento area, including meeting some new little people that have arrived since I was there last, or other people that I haven’t seen in many years (Ex in-laws and out-laws). Chuck even ran across the fact that a Facebook friend that he had as a neighor in his childhood lived in the small community that we were staying at! We had a very nice visit with Kristi Hickox… they had many (!) decades of catching up to do! This fall has found us cutting back on some of our numbers around here. Several of the Camelids, goats, sheep and rabbits have moved onto other homes (on this planet and beyond). But we still have plenty to wish you a very Merry Holiday Season, and the most wonderful of New Years. 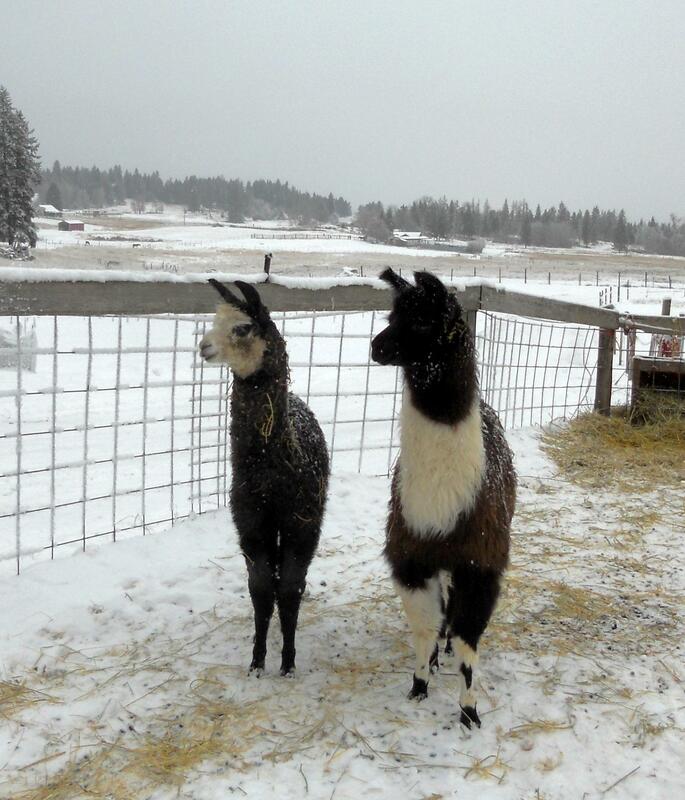 The young camelid girls Maude and Mattie, 5 months old in this photo. A young llama man and his Papa. 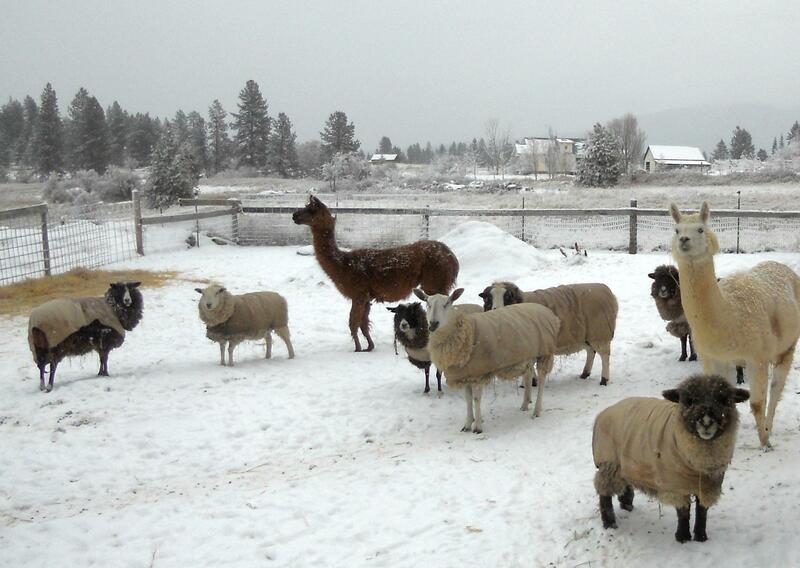 Some (not all) of the remaining wooly flock… all would want to join us in best wishes! And here it comes… the long list… in its unedited entirety. With Angel, Tiger, Konan and Konrad the cats; Iden, Justus, Blue and Katie the dogs; Finley and Kanary the house birds; all the Chickens; Cinnamon and Marjoram the goats; Neida, Huckleberry, Izzie, Henry, Maleka, Turpin, Victor, Liam and Midge the sheep; Peaches, Farley, Francis, Poppy, Ellie, Kris, Maude, Mattie and Miracle the camelids; and the rabbits: Jaime, Stella, Lottie, Lichen, Mowgli, Manny, Licorice, Reine, Leia, Kasey, Leslie, Muffin, Kanby, Marty, Mora, Marlys, Kamille, Kirsten, Lindor, Mitchell, Minnie, Mickie, Lola, Meredith, Mimi, Marnie, Marco, Layne, Kara, Murphy, Lacy, Kendra, Mimsy, Kiwi, Myron, Mork, Mindy, Mallory, Boots, Myrtle, Mabel, Milly, Kevin, Monica, Mona, Kilgore, Miller, Mathew, Mack, Martha, Beauty, Miranda and Berry!